I worked with the Crystal Cove collection of batiks and designed this fun bargello wall hanging that has appliqued cars and trailers. All week long there has been a great blog hop going on called Planes, Trains & Automobiles featuring Island Batik Ambassadors and Island Batik’s new collections. Each day a different collection is shown and today I will share Crystal Cove which is available in stores now. This is a beautiful collection! When I first heard what the theme was for the blog hop I was really stumped as to what I wanted to make. Sometimes……I just like to let the fabrics decide for me. 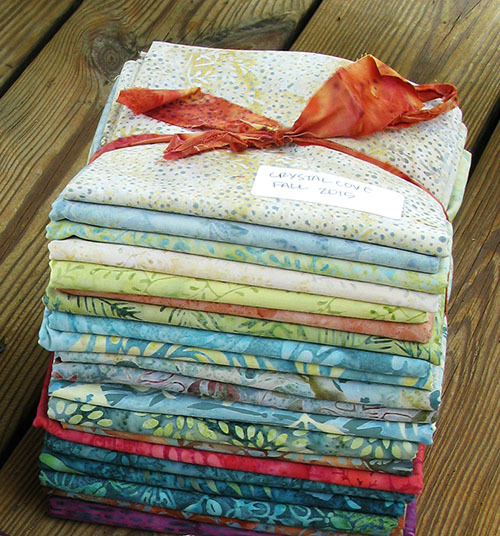 Here is the bundle I received, lots of beautiful fabrics. I started laying the fabrics out and here is what I decided to use for my quilt. All of a sudden I could see grass and a skyline. I cut strips and then sewed them together. Once I had them all pieced I cut them into different size strips for a bargello effect. Unfortunately I got excited and forgot to take pictures. Guess that means I’ll be making another one! When I had the background done I had an idea of cars and campers going on a trip so I went searching for the perfect little cars for my applique at Vecteezy.com where I am a premium member. I thought silhouettes in black would be perfect and I free motion appliqued them. For the road I just stitched a couple lines in black. The first line I stitch free hand and then realized my lines would look a lot better if I put my regular foot one and the feed dogs up. Much better. The finished size is 24 x 32. Taking photos on the deck on a day without wind means including Iggy! I wonder what the real eagles think when they see him! Did you know that Island Batik has a store locator on their site? You can click here and put in your zip code and a distance (I put in 100 miles) and it will show you quilt stores that carry Island Batik fabrics. You can also find online stores that carry Island Batik fabrics. I have several other projects made with Crystal Cove that I’ll be sharing soon. How would you like to win five 1/4 yard pieces of Crystal Cove! Very easy, just leave me a comment. Giveaway ends March 4th at midnight CST. Oh darn! I missed the giveaway! That's ok though because I rarely win anyway. lol I do want to say that I love your little campers being pulled over your colorful Bargello hills. We are going to be pulling our RV over some very rainy and windy hills the next two days as we make our way to our new retirement town of Florence, Oregon. Our home is sold here in CA and we are off to start a new chapter of retirement in a new town and a new state. Looking at a house on Monday if the storm lets us get there. Love, love, love the house we picked out. There is a bonus room above the garage. If the owners accept our offer guess what that means to me? Yep, a sewing studio!!!! A VERY long awaited studio. We are so very excited!!! I can see that you must be enjoyinsdkkol. Thanks for hosting this blog hop. I've seen some gorgeous quilts. Stunning. Caravan!!!!! This blog tour is amazing! Your caravan quilt is so cute and the background is perfect for the design, I love it. Island Batiks are some of my very favorites. That is the brand my local quilt shop carries so I have many beauties from their past lines and I will be looking forward to adding some of their new ones to my stash. Very neat wall hanging! I hope your caravan has fun! Love your caravan!!! Absolutely perfect for those fabrics!!! Your snow is a bit whiter than the sand here on Oahu…isn't spring supposed to be on the way??? You always come up with ingenious designs, Connie! These Crystal Cove batiks are yummy. Mmmmm, Crystal Cove – beautiful! What a fun quilt! I am really enjoying seeing all the ideas with these gorgeous batiks. Thank you. Cute little mini, love how you diced it up to add some extra texture. Love your background and the fabrics. I have been following your blog for awhile, please keep it up. I like how you created the background with a bargello style. The prints are so lively that the background is just perfect for the silhouette of the cars! It's fabulous, Connie! I like how you have them on a curve, adds such wonderful movement to the piece. Love your quilting caravan! You made very good use of the fabrics! What a cute quilt. Love the colors. Thank you for the opportunity. This quilt is absolutely adorable! So creative! The colors in the fabrics are beautiful! Thanks for the giveaway! WOnderful colors that would brighten up my stash! Thanks for the chance to win. You always come up with great ideas for the bundles of batiks. You've taken Bargello to a new level. I luv the silhouettes too. Love the colors in this line. Very cute quilt too! That's such a cute quilt! Those colors are luscious! Love your caravan! What a great idea! Thank you for sharing. Greens are my favorite. I would love to win! I just stopped by to view Tuesday's linky and wow. Gorgeous fabric. Put My name in, please. Now back to Tuesday. Neat wall hanging! Batiks are so great to stitch with! Have a great day. Love batiks. I have never tried a bargello quilt, but it is on my bucket list. Thanks for sharing. I love the design you came up with for the fabrics. The cars and campers just seem to bring the background to life. Perfect quilt for a mascaline room. I have a 13 yr old grandson who loves quilts and any that have planes, trains, and/or cars he just goes nuts over. He will really love this one! You have created such a brilliant and unique quilt with these lovely fabrics! Thank you so much for sharing your creative design talents. Plus, adding a chance at the beautiful fabrics you are giving away…oh how magnificent! Have a fantastic creative day! I love your caravans! Makes me think of camping as a child! I love the quilt. It is so cute and would be perfect for my grandson who is very into vehicles right now! Your project is adorable. Love the colors. Unique quilt idea for us to drool over. Love what you did. Made me think of doing something like that for a sewing machine cover. Thanks for the inspiration! Great quilt. I love these fabrics. 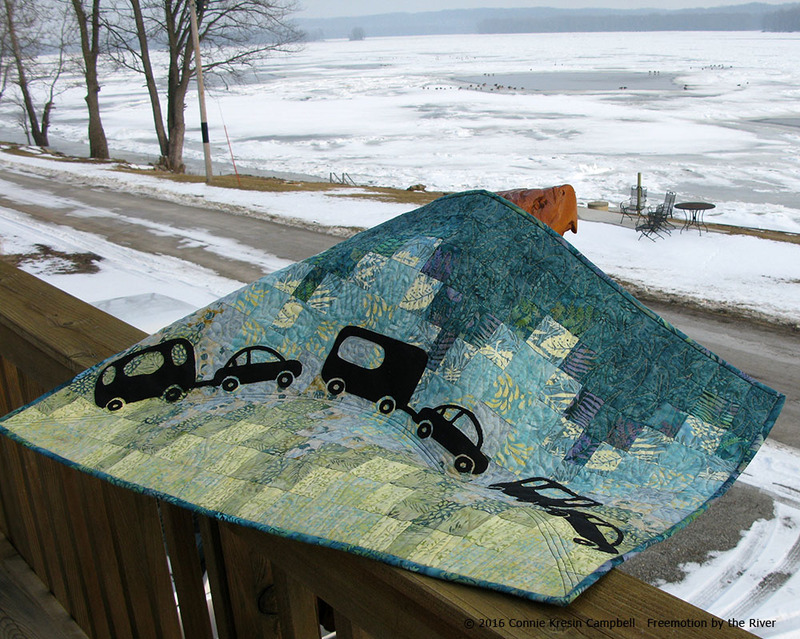 Great quilt–love your line of vehicles! Such a great quilt. Love the cars and campers. Love the fabric. I really love the black silhouette of the caravans and cars – and the plane – on the gorgeous colours of the pieced background – awesome design. These batik fabrics are yummy! Love your quilt – very creative. Thanks! I made a camping quilt a couple years back and this idea would have been great. Just appliqueing on a car and a trailer would have been the icing on the cake. Will remember for the next one I make. Yours turned out so pretty with those Island Batiks! Your quilt is so fun and the fabric is beautiful! Thanks for the chance to win! I love your camper quilt and love the fabrics. That is very cute. Nice idea. What an awesome quilt! It would be a great gift for a camping enthusiast. Thanks for the give-away! Your quilt is adorable and I love the bargello effect that you used. I can tell that you're dreaming of warmer days especially since the cold landscape in the pictures means it'll be awhile till spring becomes a reality here in Iowa. What a creative mini quilt. I love the colors in the bargello background and the cars in silhouette are perfect. Next to quilting, camping is my therapy – being out in mother nature. Your batiks remind me of being in the woods; love it and the campers! I would love to go on camping tip across that wonderful batik landscape that you created. The quilt is gorgeous. Thanks for the chance to win! Love the background and the wonderful design that you have created. IT is a fun blog hop and it is great to visit some old blog friends. Love your project. Great use of the beautiful batiks. Fun quilt and beautiful fabrics! Thanks for sharing. Your quilt with the vehicles is lots of fun. Great idea to do the applique overtop. Love your quilt and the camper vehicles. These are my favorite colors. Thanks for the opportunity to win! Love your cars and campers! I like how you placed them on a curve. Thanks for the giveaway. I've never been drawn to batiks before, but Island Batiks is winning me over with all the gorgeousness on this blog hop! Love your pattern! Thanks for the chance! I love the colors! You have made me a lover of batiks. I have started collecting so I can make a quilt with all batiks. Love the fabrics and your cute little quilt! Thank you for the chance to win. I swear, each day the fabric gets better and better!! Love Island Batik lines! Connie, this pattern is amazing. I love it! Will it be one you sell in your shop? I think I like your project the best. The fabrics fit a bargello design to a T. A bargello pattern is on my bucket list, but you know how that is, too many patterns and not enough time. Your table runner is so cute! Love the little cars, and campers. Love what you did with the fabric. Thanks for the giveaway. Love your blog. Crystal Cove is gorgeous! I could think of a lot of neat sewing projects using it. Thanks! I love this Connie, the colours are devine. Thanks for sharing your thought process with us. I always find that so interesting. And I'm crazy about silhouette quilts. When I was a little girl, my grandmother had little pictures that had old-fashioned silhouettes painted on the inside of the glass, with the backgrounds painted on the back of the frame. Do you remember those? I loved those little pictures, which she hung over the bath tub. They are among my most vivid memories of her old farm house, and I'm always on the look-out for something similar when I'm at antique stores. Just now it occurred to me that I might be able to quilt something a bit like that! Thanks for the inspiration. Your quilt is adorable. Great use of the fabric for a fun design. Love the cars traveling along- so fun! The fabrics work beautifully in your design – lovely! Very cute idea for a quilt and perfect for the theme! The batiks are gorgeous, as usual. Great little quilt! That's my kind of traveling- hills and mountains! Very cute design. I love the batiks! Thanks for the fun! Just beautiful…..I would love to make one for our RV. I love playing with fabric, even if I don't get anything made. I like how you made your little quilt. The campers are cute. That is just the cutest idea! Love those silhouettes. And the colors in those batiks are so beautiful. Wow! I love the little quilt you made, the batiks are just in my line of colors! The silhouette cars make the picture perfect! The little cars are too cute. Great quilt. Very cute quilt. I love the colors. I would love to win. I just love batiks. These would be wonderful to have. Such rich colors. Will have to look for the yardage on these. Wow Connie! Your quilt turned out perfect! Love this fabric too. Lovely fabrics and a fun project. Thanks for sharing. The Crystal Cove color palette is so calm and serene. Not only do I want to quilt with it, I also want to go there! Love your quilt! Thanks for sharing! Love, love, love this idea!!! Those batik colours are gorgeous!! What a clever design! The background is beautiful and the silhouettes are perfect! Love the way the fabric spoke to you as you designed this charming quilt. Reminds me of road trips taken as a family. I love the car trip through these batiks, what fun! Gorgeous colors. This is a super cute project and I love the bargello effect. Batiks make my hart go pitter pat. Oh, I do love the bargello you've done. You're "sew" right, the grass and sky is just perfect. Love your little caravan to complete it too! So creative! Those cars and trailers are adorable! And the bargello background works so well with them. I love how you laid out these gorgeous Island Batik fabrics and let them speak to you. Your landscape Bargello background is perfect for your caravan. Iggy looks ready to have sunshine. Embracing Creative Batik Bliss…. I want to get on board one of those cute little cars and head to a warmer place… The giveaway is wonderful… hope to win. thank you. I love Island Batiks. The colors are just so rich looking. Will need to see if our local store has any in stock. I absolutely LOVE your camper quilt. What a fun design that is perfect for this beautiful fabric. Thanks for the introduction to Vecteezy.com. I'm always on the outlook for sites for good graphics. Sew cute!!! I used the store finder but found it is not up to date since my local store has been out of business for 3 years. The caravan is really cute. The Island Batiks are lovely. The Crystal Cove fabrics are beautiful and blend so well together.I love the little cars and campers. What a great idea with blending the greens up to the blues. You are so talented with another great quilting project! Love those fabrics….just calm and inviting! Thanks for the chance to win! Love your caravan – beautiful batiks – my favorite! blues and greens have always been my favorite combo. You did a wonderful job on this…so creative! Very cute design with these lovely fabrics. I am a sucker for any bargello style pattern. Your camper quilt reminds me of all the camping vacations I've taken with my family! Very cute!! Connie, this is such a creative quilt! When I saw the greens and blues, I thought the same thing…land and sky. You should enter this in this week's challenge on Persimon Dreams blog. The theme is "Take A Vacation"…lots of great prizes to be won! Those cars and caravans are cute! Those batiks look lovely. OMGosh! I love the green fabrics. My mottos is, "you can't have too many greens" A great little quilt. We have a camper and I love your automobiles pulling campers up the road. I love the batiks! Greens and blues are almost always my "go to" colors! Thanks for the give away. I LOVE batiks and your quilt is gorgeous. Thanks for the (sort of) tutorial. The fabrics are gorgeous! Cute quilt. I adore what you did in the wall hanging… since I love batiks it really struck me. Thanks for sharing and the win offer. I love this project, it turned out beautiful with the fabric combination. I can't wait to see what you create next. Thank you for the giveaway. Lovely! Thank you for this opportunity! I really like your piece. Thanks for sharing the batiks. What a cute idea with the cars and trailers Connie. This is a super cute quilt though I would need a pick up truck in my caravan quilt! Thanks for sharing and for the chance at the giveaway. I am patiently waiting for our snow and cold temps to disappear so the caravan can begin once again. What a lovely quilt! The skyline idea was brilliant. What a GREAT idea! I just love your little caravan quilt. Thanks so much for the chance to win such beautiful batiks. I am becoming a convert and adding more and more to my stash. Time to use that locator and find an Island Batik dealer near me! The caravan made me chuckle. Very cute. Really like your grass and sky effect! Love your quilt with all the cars. If I were to win I would do an ocean beach scene since I live in Florida. Very clever and coordinates well with the blog logo. Over the river and hills to grandmother's house we go…. Love how creative you are! This is adorable! That is a really cute quilt. It tells a wonderful story about going on a vacation. That is really cute, Connie. WOW Connie you have done it again. YOUR QUILT IS LOVELY. And it really looks like they are taking a trip through the city and woods. So great. thanks for inspiring again. Love the caravan! The crystal Cove fabrics are lovely! So cute Connie! I love the cars and campers traveling across the quilt. A great idea for these fabrics. Thank you for the giveaway. I was chuckling as I saw the camper. While checking out everyone's post for the hop I have been thinking to myself what I would have done if I would have made a project for it. And my camper came to mind! Your quilt is such a cute one! Of course gorgeous fabrics! Wow, another winner!! Thanks for sharing your wonderful talent!! What a creative display of the batiks! Lovely!! Beautiful, I love your project, thanks for sharing and the chance to win! Great quilt. I'd love to win some fabric! Such a cute quilt! I love appliqué with black silhouettes. And the batiks are just lovely. Great quilt! Thank you for the giveaway. I love your French Roasted Scattered quilt on Facebook too! Thank you for your give away! You came up with a really good idea for the hop, I like the cars on a curve like they're traveling the world. Love your little vehicles ascending and descending a hill-very cute! What a fun theme, thanks for the chance to win. Adorably creative! I love it. Love your cars, and batiks! Thanks for the opportunity. Love the batiks and the quilt…this one made me smile…so fun! You have such a wonderful imagination and design sense. I love what you have made. The fabrics are also terrific! Such a cute quilt! I like batiks and think they are well suited to bargello. Your quilt is very cute. Thanks for sharing. great caravan, somehow it made me think of the movie "what's eating gilbert grape"
Good insight on the colors! I really like the flow of the bargello and those campers are darling. The Rvs and road is so cute on this quilt! thanks!